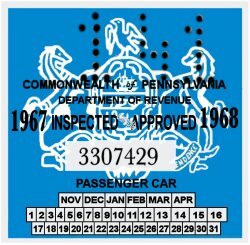 1967-68 Pennsylvania Inspection Sticker - $25.00 : Bob Hoyts Classic Inspection Stickers, Add a Final Touch to your Restoration! This 1967-68 Inspection sticker was originally issued from November 1967 to April of 1968. It was good for six months. This reproduction has been carefully restored and reproduced front and back directly from an original. It has been printed on high quality paper and ink using our patented "Peel and Stick format to allow attaching to your inside windshield. This sticker can be custom ordered with your own antique license plate number on front panel just under the date for an additional $10.